Kyle has worked as an arborist in the public and private sectors for over ten years. An arborist is an individual trained in the art and science of planting, caring for, and maintaining individual trees. Kyle took a shine to tree work right from the start. The youngest in a long line of farmers, he has loved being outside since he was a baby. When he wasn’t on the baseball diamond, he was weeding alongside his Mother, a true landscape artist, in Milwaukee, WI. Eventually, Kyle would go indoors and graduate with a degree in Criminal Justice from Carthage College in Kenosha, WI. He would later garner a degree in Fire Science from MATC, as well. Unable to deny the call of the outdoors, he proceeded to work all over the United States, maintaining trails, building landscape construction and, in the end, tree work. Back in Wisconsin, Kyle was trained as an arborist with the City of Milwaukee Urban Forestry Department. Their rigorous program is renowned for emphasizing safety precautions in the trees and on the ground. Upon graduating, Kyle was selected as one of the top students in his class and recruited to work in the private industry, where he learned the art of residential tree work, as well as the importance of communication and building interpersonal relationships. These lessons have proven invaluable. As Kyle’s love of arboriculture grew, he found there was a need for individualized, honest, safe and dependable tree services in more rural areas of Southeastern Wisconsin and began working for friends and family in his off-hours. He work was received with such success that he started purchasing his own large-scale equipment and dreaming of becoming his own boss. In time, with more than a little hard work and perseverance, that dream became a reality. Kyle is an avid sportsmen and fledgling hobby farmer. Delighted to relocate his family to Evansville, WI, he now has the space, freedom and forest to pursue his hobbies. The Mallons hope to flourish their business in this idyllic agricultural hub. Emma has roots in Evansville, Stoughton and Cooksville, WI. With a degree from UW-Madison in Journalism and Mass Communications, Emma is learning all about the tree business from the ground-up. 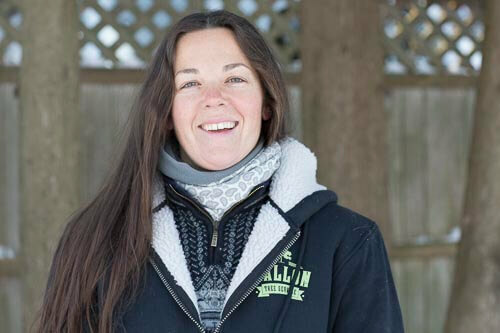 She is Mallon Tree Service’s office manager, organizer and on-site assistant when out in the field. The Mallons pride themselves on being as self-sustainable as possible on their acreage outside of Evansville. The land has been in Emma’s family for over fifty years. Her grandfather, John Wilde, was an internationally known artist, a surrealist painter and master of silverpoint. Her father, Jonathan Wilde, is an established wildlife and landscape painter in his own right. Emma is grateful to breathe new life into the Wilde property, in a Mallon way. She spends much of her free time splitting wood, gardening, cooking, running long distances, and tending to the animals. She is also currently working towards becoming an ISA Certified Arborist. While I have always had a love for the outdoors. My interest in arboriculture began a few years ago when I started working for a small tree service in Shopiere, WI. I believe we are to be good stewards of the land, and the work I do with Mallon each day is one way to do my part. Tree care is even in my blood; my great-grandfather was a tree climber in southern Wisconsin during the 1950's and 60's. In addition to climbing trees, I also love spending time with my wife and two young children, Sawyer and Riley. After graduating high school in Brodhead, WI, I was unsure of my career path. With a love of outdoors, machinery and a background in farming, I followed a diesel mechanic path at Blackhawk Technical College. I was drawn to the challenges of working on tractors, but being cooped up indoors was not for me. After trying other pursuits in southern Wisconsin, I fell into tree work on a whim. After working with Mallon Tree Service for a year now, I feel this is the best job I have ever had and truly enjoy the every-day challenges of being an arborist-in-training. When not working, I enjoy farming my 80-acre organic farm. My three best helpers around the farm are my kids: Harper (3) and Elijah (1) and my wife Andrea. My love for the outdoors and desire for constant variety have led to 12 years as a professional arborist. After graduating from Mid-State Technical College with a degree in Urban Forestry, I earned my arborist certification and began working for another Wisconsin tree care company. During my 12 years there, I helped build and eventually led their Plant Health Care Division. Fueled by a desire to run my own business, I left and started The Tree Doctors out of Watertown, WI. While running my own business, I work for Mallon Tree Service part-time and get to enjoy the benefits of tree work and a lack of redundancy! When not working in the trees, I like to spend my time hunting and fishing and hanging out with my pup, Penny. Addison is a local student at Stoughton High School. He joins Mallon Tree Service in the summers and thoroughly enjoys being part of the crew!